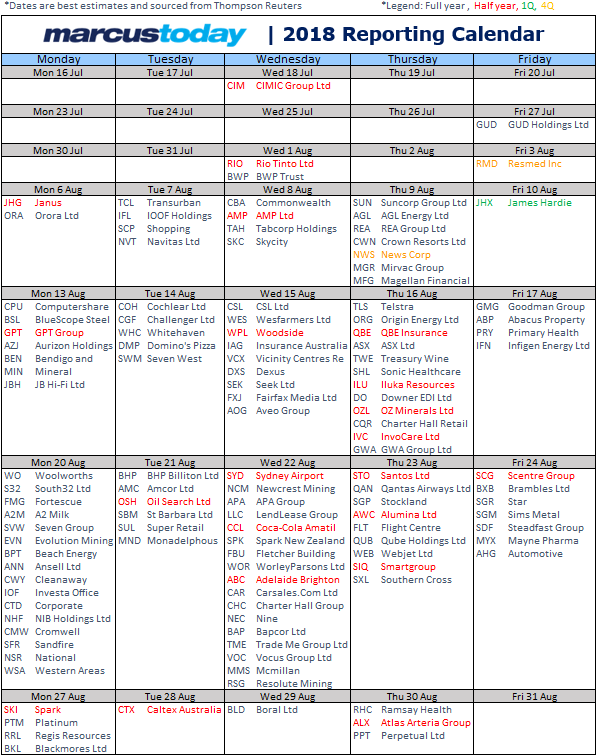 Here is the ASX 200 results calendar - the results season is still a couple of weeks away. As usual, it is a best endeavours calendar, some companies simply don’t set a reliable date. The big companies generally do. Good results for energy companies (WPL, BPT, OSH, BHP, STO, WOR) on the back of a sharp rise in the oil price. The oil price is up 22.6% in the last six months and 61% in the last year. Very hard to produce bad results against that backdrop. Iron ore exposed companies (BHP, RIO, FMG) unlikely to be dancing on the tables with a 9.1% fall in the iron ore price in the last six months although the iron ore price is still up 15.7% this year. Big international companies exposed to the Australian dollar (ALL, BSL, BXB, COH, CPU, CSL, MQG, PDL, PTM, PPT, RMD, SDA, SEK, TWE) will have benefited from the 5.1% fall in the Australian dollar in the last six months taking it down 3.7% in the last financial year. We have already seen some profit upgrades ahead of the results season from big international stocks. Running into these results most of them should have the earnings risk on the upside. The Banks (CBA) will see the full year results from the CBA (August 8) and quarterly results (with no dividends) from the other three majors. If the most recent results from the ANZ follow-through for the CBA we may well see a better than expected dividend and the bank awash with cash and comfortably exceeding their tier 1 capital ratio. The property market is a big driver for the banks, and that has certainly cooled over the last six months and, compounded by tighter lending restrictions growth and margins are unlikely to have surprised on the upside. After the recent bank sector rally the pressure is on for the results to underpin the rally rather than undermine it. No disasters are likely, and no disasters will be a good result considering the low level of bank sector sentiment. AMP results will be of tremendous media and investor interest after the revelations of the royal commission. On current forecasts, the stock looks cheap which suggests forecasts are too high or the share price is too low. This set of results should decide the issue one way or the other. Resurrection or crucifixion. Retailers will be interesting to watch (JBH, HVN, KMD, NCK, MYR). Have they survived the Amazonian onslaught, have they survived the online onslaught, have they survived a lower Australian dollar (not good for retailers who import goods to sell). A peaking property market doesn’t help either. The risks are on the downside running into results. Telstra’s results on 16 August are always dull. Can you strip the dividend and not lose money is the question. The share price recently bottomed but the results are more risk than reward. They have recently had a rather disappointing strategy day which included a downgrade and bottom end of the guidance range, so results shouldn’t surprise either way. They said they would hold the dividend by selling assets. Brokers are still forecasting future dividend cuts. Infrastructure stocks and companies exposed to infrastructure spend (CIM, BLD, JHX) have had a dream backdrop and results should reflect that. CIM results one of the first cabs off the rank on Wednesday next week. Gold stocks (NCM, NST, SBM, RRL, OGC) unlikely to impress against a 3.8% fall in the gold price in the last six months. Smaller Resources - Amongst the metals, copper (OZL, CDU, SFR) has fallen 8.6% in the last six months (up 11.6% for the full year), zinc has fallen 5.95% in the last six months (up 11% in the last year), and aluminium (AWC, RIO) has fallen 14.01% (up 3.5% in the last year). Mining Services companies (WOR, ORI, ALQ, SVW, MIN, MND) tend to succeed later in the resources cycle. Resources have been undergoing a resurrection in the last 18 months which should feed through to mining services companies this results season. Nickel stocks (PAN, WSA, IGO) - The standout performer amongst the metals has been the nickel price up 16.8% in the last six months and up 58.7% in the last year. They have had a very favourable backdrop for these results. Stock market stocks (MQG, PTM, CPU, GBT, PPT, CGF, IFL, MFG, ASX, IRE, JHG, as well as the banks) have had a fairly healthy backdrop over the last year with the All Ordinaries index up 9.12% and up 1.98% in the last six months. The US market has been a bit subdued with the S&P 500 up 1.7% in the last six months although it is up 12.17% in the last year. Most of the fund managers announce funds under management every month, so there is little that should surprise from them. MQG, in the absence of any major market disruptions, have no excuse but to produce their better than expected results as usual - results are not until November. The US results season starts this week. 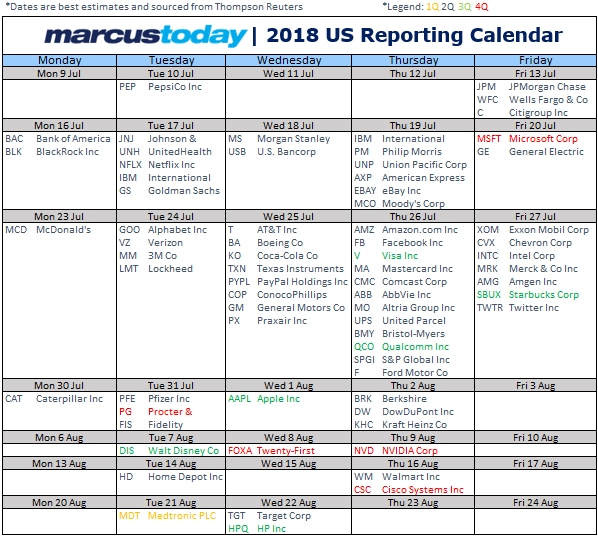 There are a lot of newswire headlines about the US results season which gets going on Friday with results from JPMorgan, Wells Fargo and Citigroup. PepsiCo jumped 5% on quarterly results this week. There is nothing quite like companies making money to help the equity market. Trump’s December tax cuts are expected to continue to play very favourably for the whole market but particularly the financial and technology sectors. The consensus is for 20.7% earnings growth from the S&P 500 companies with the energy sector expected to see earnings growth of 140.7%, resources 33.6%, technology 25.5% and financials 22.2%. The lowest growth is expected from the utilities at 1.2%, REITs at 2.3%, telecoms at 7.4% and Consumer Staples at 9.7%. This is a table of expected earnings growth. Whilst we are supposed to look forward to the US results season the usual pattern, apparent in April (the first quarter results season the US), is that the US market rallies ahead of and for the first two weeks of the results season month, then in the middle of the month (in about a week) it then tails off as the market asks “that was good, but what’s next” and starts profit-taking.